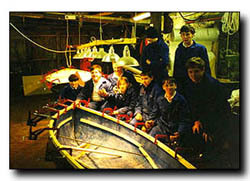 One of the primary out-of-school learning activities offered by the Trust, and one designed particularly to give greater employability to our young people is boat building and fibreglass fabrication which takes place near St.Keverne, at Lanarth. Currently Mullion School is mainstreaming this activity and offering it to year 10 and 11 pupils. Students have obtained RYA Level 2 Powerboat Certificate. With help from "Go Kerrier" and the RYA "On Board" scheme, from summer 2005 there will be a Saturday morning activity for Sailing, Powerboat and Water Safety. LOT is planning a River Awareness Project, using its 10-man RiB; the focus will be on the environmental aspects of the Helford River and estuary. Quote from Young People: "We learn a lot about boat design, how to do new jobs, learn to sail, and have fun!"